Any creative person knows that pursuing meaningful work also means climbing aboard an emotional rollercoaster. One moment, you’re on top of the world, stepping out onto a stage, or hitting “publish” on a post. Then a disappointing email or a critical comment about your work sends you plunging into despair. As a perfectionist with an honor-student complex trying to navigate the real world, I know these feelings very well. Those of us who pride ourselves on being goal-oriented can get so emotionally wrapped up in success that the results of our efforts start to dictate our happiness. We begin to over-identify with achievement. It’s easy to stay motivated when things are going well in your career. But when you’ve invested your whole self in writing, the arts, or even starting your own business, falling short of expectations can be a major blow. Unfortunately, we can’t always control the outcomes of our efforts. But we can better prepare ourselves for the possibility of failure. We can build resilience so that we keep striving even in the face of setbacks—the key is making your own emotional contingency plan. The WOOP method, created by psychology professors Gabriele Oettingen and Dr. Peter Gollwitzer of New York University, has been scientifically proven to improve everything from academic achievement to drug addiction. The strategy uses mental contrasting to help develop a concrete plan to achieve your goal, as well as how to recover if you don’t. Choose a goal that’s important to you. It should be challenging yet realistically attainable. Imagine the best result if this wish came true. Identify the main inner obstacle that stands in the way such as an emotion, irrational belief, or bad habit. What is it within you that holds you back from fulfilling your wish? Now create your contingency: If faced with (obstacle), then I will (take this effective action in response). Because it requires you to think ahead about likely pitfalls that may be demoralizing, the WOOP method helps you build an emotional contingency plan. 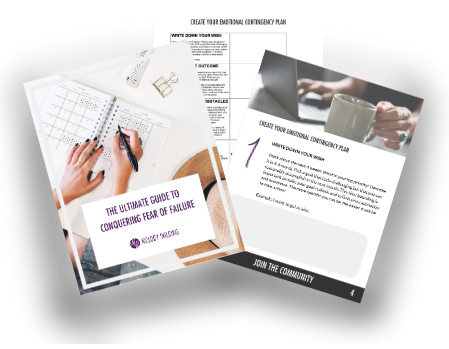 By reframing obstacles as opportunities—not devastating roadblocks—you internalize failure less and can easily move past difficulties by following the action steps you’ve laid out. Want to create your own Emotional Contingency Plan? Put in your name and email for a free template. Another form of emotional contingency planning involves diversifying your goals. According to quality-of-life research, people experience higher levels of well-being when they have multiple goals across different life domains, and not just in one single area. Essentially, this backs up the old adage “don’t put all your eggs in one basket.” Going all-in on your professional pursuits may backfire, leaving you always teetering on the edge of emotional over-investment. But it’s hard to mope too long over a rejection letter if you’ve got a cooking class on the same night, and have plans to go on a camping trip with friends over the weekend. In this way, it can be helpful to better to think of our lives as a “happiness pie,” comprised of different segments like career, family, health, friends, and community. Yes, some slices may be bigger than others. But ultimately it’s important to respect that each slice needs tending to if you want to optimize not only your success—but your sanity. This approach prevents over-investment in any one area and makes sure your goals are balanced to nurture all parts of your life. When I notice my own workaholic tendencies flaring, I realize it’s a sign that my “happiness pies” needs attention and possibly recalibration. I ask myself if how I’m spending my time is an accurate reflection of my values. You can do the same. If you claim that making time to be creative is important to you, yet your art supplies are gathering dust, what’s one action you could take in the next week to change that? Put simply, when you feel good after reaching one goal, it’s easier to achieve others. The greater your motivational reserves, the more you have to draw from for emotional contingency when the going gets tough. So take the leap and try that guitar class, or try that yoga class—such pursuits may give you the confidence boost you need to navigate the emotional rollercoaster of a meaningful, and more perfect life. Success! Check your email to download the guide.